Clip Strip® is a registered trademark of Clip Strip Corp. Use of the Clip Strip® term to describe competitive strip merchandisers constitutes an infringement of our trademark and patent rights.Clip Strip® Brand Merchandising Strips, also known in the Point of Purchase and Store Fixtures business as Display Strips / Hang Strips / Hook Strips and Impulse Strips, are the invention of Edward D. Spitaletta, our founder, back in 1980. 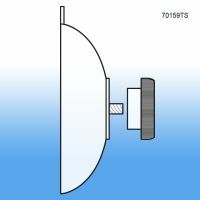 The idea behind the invention was to find new ways to merchandise products at retail and ultimately increase sales, including valuable "impulse sales." 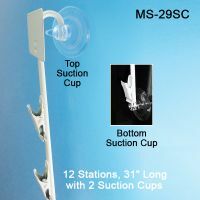 The merchandising display strips are designed to hang off shelves, price channels, Gondola units, adhere to walls with tape, on poles, display racks - all the while using zero floor space. Clip Strip ® Merchandisers turned wasted space into high profit areas; this was a store manager's dream. Today, very little has changed, Clip Strip Corp. has evolved the invention into a full line of strip merchandisers, made in plastic and metal with hook mounting and now with adhesive mounting with our innovation the Sticky Strip™ Brand Merchandising Strip. 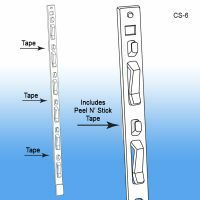 Clip Strip Corp. has a large selection of merchandising strip styles to choose from. 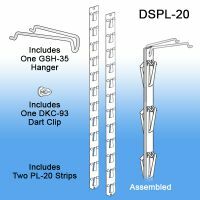 We will help you match the right display strips with your product. 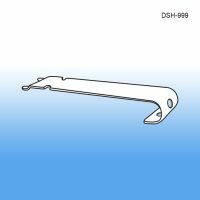 Choose from plastic or metal strips; all shapes and all sizes; with hooks, clips or adhesives. 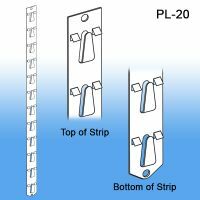 Some of our various merchandising strips include the original Clip Strip®, the Posi-Lok™ and the Econo Strip™. 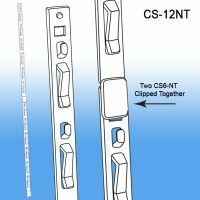 The original Clip Strip® Merchandiser is designed so items can be clipped or hooked onto the strip. The Posi-Lok™ is the obvious choice for heavier, bulkier merchandise. 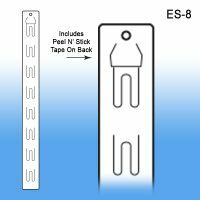 Our Econo Strips™ (aka "Economy Strips") are available in many different styles. 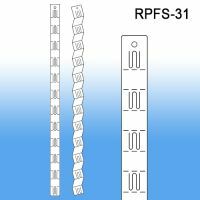 These hang strips are designed to support lighter items, and they come with shorter or longer spacing to better adapt to the size of the object being displayed. 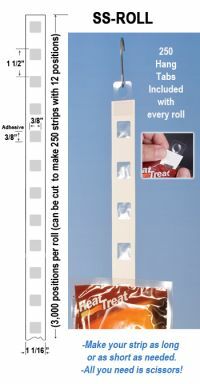 Our Sticky Strips™ are ideal for a wide variety of packages that don't have hang-holes. The patented adhesive allows products to stick well, making loading fast and easy. 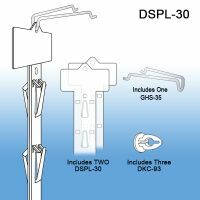 It also allows customers to easily re-attach items themselves. Sticky Strip™ display strips always look great. Our Clever Clip Style Merchandising Strips are perfect for hanging small stuffed animals and other bulky items. 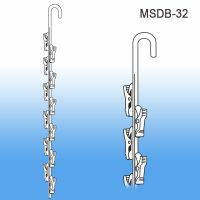 Strong plastic clips that hang from the chain allow you to display items securely. Though offered in two standard lengths, they can also be easily customized to suit your special needs. Our metal strip point of sale systems are the most strong and durable. They are re-usable and hold the heaviest, "strip-able" items. 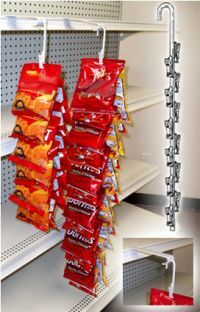 We have standard and heavy duty Metal Merchandising Strips, Double-Sided Metal Merchandising Strips and the Free Standing Snack Rack - all employing the same basic construction. 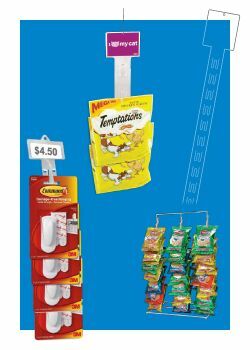 Our snack racks are perfect for the checkout counter to display impulse items. 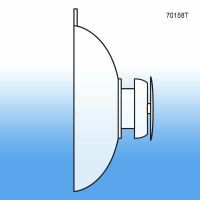 Metal Wand Retailers are permanent strips used over and over for heavier items or for products refilled residually by route drivers or retail stores with a restocking system that doesn't rely exclusively on outside merchandising field operators. 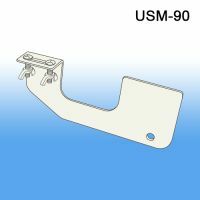 Additional Clip Strip accessories include Adapter Clips, Locking Screws, metal and plastic strip hangers and S-hooks. 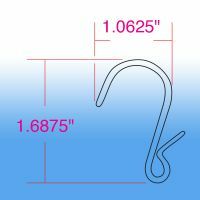 S-Hooks are the most common method used to attach strips to a variety of store equipment. Count on the inventor of this retail display for the quality you demand and a brand you can trust to produce store equipment fixtures that will stand the test of time. Nobody else can claim they manufacture "Clip Strip Brand Products", so if you want to be confident in the quality you need, make sure your merchandising strips are from Clip Strip Corp. 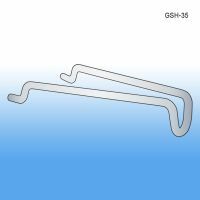 Need us to load your clip strips with your product, attach an S-Hook or other fastener, box them up and ship to you or to the end user? Contact us today about our Kitting and Fulfillment Services. 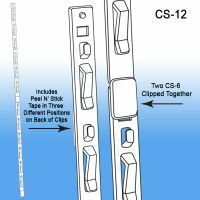 Clip Strip Corp. is a Walmart Dept. 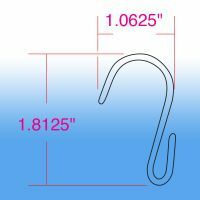 82 Approved Impulse Strip Supplier, learn more HERE. 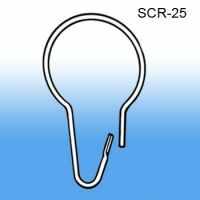 Clip Strip® is a registered trademark of Clip Strip Corp. Use of the Clip Strip® term to describe competitive strip merchandisers constitutes an infringement of our trademark and patent rights.